Walking down a narrow flight of stairs, I was led into a huge room, one that was filled with recording equipment, a turntable, and a generous amount of guitars. There were two dudes sitting by the equipment, tinkering around as they slowly turned toward me. They introduced themselves as Trey Schibli and Theo Klein, the undeniably cool frontmen of the band argonaut&wasp. Seated in their studio, Trey handed me a hot toddy, the pre-game drink for night, and we began to discuss music and life and our favorite Disney princesses. Hanging out with Trey and Theo was really like catching up with old friends instead of meeting new ones. They jammed for a bit while I vibed, and several Hot Toddies later, they finally gave me a sneak peak of their latest music video, “Disco Disco (The Drum Song)”. The video is a comical account of two guys being chased by a robot who just wants to play the drums with them. Filmed by the PF Brothers, “Disco Disco (The Drum Song)” sets the standard for other music videos coming from Brooklyn, due to its creative use of animation, interesting locations, and likeable characters brought to life by Theo and Trey. Watch argonaut&wasp’s “Disco Disco (The Drum Song)”, and get a glimpse into it all with our interview below. Who is argonaut&wasp and what is your music all about? Theo: argonaut&wasp is myself (keys/vox), Trey (guitar,vox), Alec (bass), Cole (guitar), and Chris (drums). We try to blend the danceability of electronic music with the rawness of rock and roll. Our music is a conversation among ourselves as an act (our attempt to communicate a moment or a feeling), and to our countless musical influences (i.e. Talking Heads, LCD Soundsystem, David Bowie). Trey: For me, Princess Jasmine. Who came up with the concept for your video “Disco Disco (The Drum Song)”? Theo: We worked in tandem with the incredibly talented Dakota and Dylan PF (two brothers that I attended primary school with). I had been following their work closely, especially drawn to their unique mix of animation and thoughtful imagery. While writing “Disco Disco“, a psychedelic dance tune, I knew that we needed a visual component to carry the story. 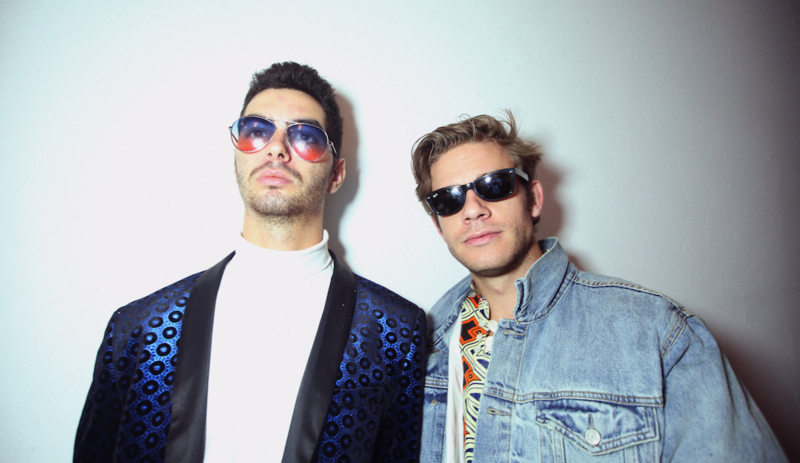 Dylan & Dakota (The PF Brothers): argonaut&wasp initially approached us last fall to collaborate on a music video for “Disco Disco (The Drum Song)”, a track off their latest EP, “Ha! Fiction.” We thought it sounded like a great gig and immediately signed on. The two of us have individual backgrounds in painting, sculpture and animation and have wanted to angle our style around incorporating those elements into mixed media filmmaking. This video was the catalyst for our new mixed media style, and it has become increasingly more important to embrace those forms and include them in our current and future film work. We wanted to use these techniques to help match our visual style with a musical narrative to create a video that was both aesthetically and narratively engaging. argonaut&wasp seemed like the perfect band to try something like this with. Their upbeat sound and funky vibes let us think about the film in a way that was void of restraints. How did you find the shoot locations? Theo: Dakota and Dylan took point on this. We shot half of the video in BK and the rest in Long Island. PF Brothers: First we come up with our ideas, which almost always require wild locations. Once we have a sense of what it should look like, we think of all the places that we have explored prior, or research urban legends until we find something suiting. For example we had been to the graffiti ridden forest ruins featured in Disco Disco once before. However we could only vaguely remembered it. To locate it we spent 12 hours driving around the general area questioning locals and poking around wooded areas until we found a lead. How long did filming take? Theo: We did the entire shoot in one weekend – it was jam packed but it was awesome. Also, I know it took Dakota a while to make the animation sequences. How did you come up with the characters you portrayed? Theo: Characters! Characters? These are us! Ha. We tried to exaggerate our reactions and expressions. PF Brothers: Well argonaut&wasp already had been developing their own characters independent of us. We specifically wanted to work with those characters because they already meshed with the aesthetic of the band. The giant robot character was a bit random. I think we were brainstorming generally about boom boxes and got really carried away. Before we knew it we were dumpster diving all over south Brooklyn for trashed electronics (which by the way involves some pretty sketchy materials and situations). If you can work with any actor or actress in your next video, who would it be? Theo: If I could work with one actor in my next video it would Ben Stiller because he is the man. Bill Murray. 100%. Not really to work with or anything, more so to hang out with him and go get into some trouble. What do you love the most about making a music video? Theo: I love creating. To pair visuals with an auditory experience brings the entire package to the next level. It allows an artist to collaborate with other artists, to share a vision, and to riff on new ideas. It is also just a lot of fun – getting in character, finding/building costumes, looking for props, and then… those special words, “We’re rolling”. Trey: We work hard to create character within our music. Physically embodying that for the camera brings you right to the core of the inspiration that birthed the song. The process is always exhilarating and challenging; ultimately adding dimension to a work of art that’s scale isn’t fully realized until you’ve finished. What is the the most difficult thing about making a music video? Theo: There was not too much that was difficult on our end. We had a blast. Are there any directors or cinematographers that you would like to work with? Theo: We definitely plan on working with these guys again… and our go to man himself, Patrick Elmore (In the Drown, Pistol Pump Funk, Loser Like You). Trey: Alex Morsanutto is another director I am trying to coordinate a project with. We have done work together in the past, but nothing strictly for A&W. We wrote an original piece for a film he directed, it’s actually playing this weekend (Nov. 18th -20th) at the Williamsburg Independent Film Festival at The Wythe Hotel. If you could be someone else for a day, who would you be and what would you do? Trey: Don Quixote de La Mancha, and set out to revive chivalry, undo wrongs and bring justice to the world. Theo: I would be Michael Jordan, drain threes and dunk over everyone. You have lived in New York City for about a year. What have your learned since moving here, personally and creatively? Theo: “In the city it’s hard to sleep”… While these may be lyrics from the song, its true. Whether you’re exhausted from doing too much, or there’s just too much to do – sleep is something rare for us. Being in NYC is awesome. We’ve had the opportunity to meet and befriend amazing musicians and artists that we are excited to work with in the future. It’s also very easy to get caught up in the day to day existence of living in the city. Very important to look at the big picture, go on trips, and talk to people to get perspective. Trey: Would like to reiterate Theo’s point about making time to step back and look at the big picture. The magic of New York is that from the first moment you step foot here, your feet won’t touch the ground until you step out. This city moves you. Time to reflect on where you are going is crucial. Theo: Writing, recording, and practicing. We are stoked for 2017. Trey: The songs we have in our back-pocket for 2017 have me more excited than ever for argonaut&wasp. Keep up with argonaut&wasp here.